Cazino Cosmos is Yggdrasil’s official sequel to the great video slot, Cazino Zeppelin. 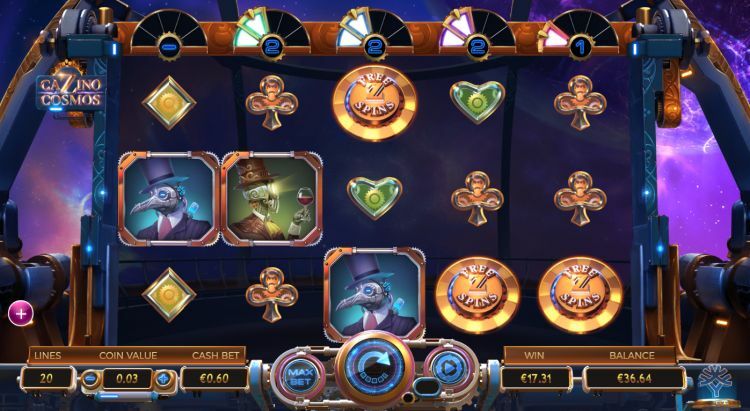 Cazino Zeppelin, then again, is one of the few slots that has managed to be a successful variant of Dead or Alive, the ultra-popular high variance slot by Netent. Cazino Cosmos, in any case, sticks to the Steam Punk theme of Cazino Zeppelin and adds a few exciting features. 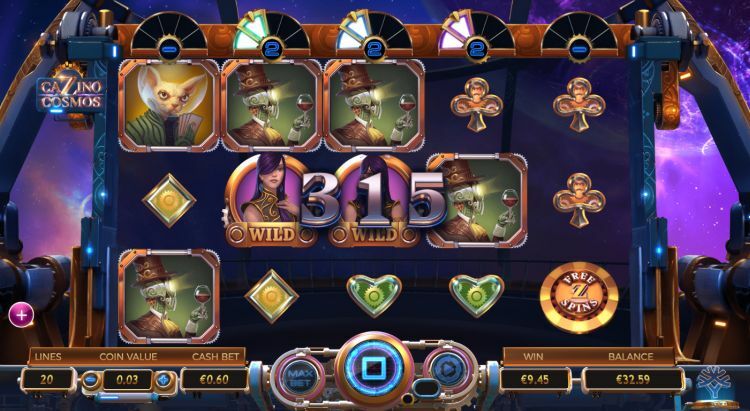 Yggdrasil stages this slot game in a wonderful futuristic world. Their graphic designers are incredibly talented and know how to bring the most beautiful slots to life on their drawing tables. Apart from the fact that Cazino Cosmos looks beautiful, it has some more cards up its sleeve. You can for example save for 4 different free spins bonuses, each with their wild boosters. 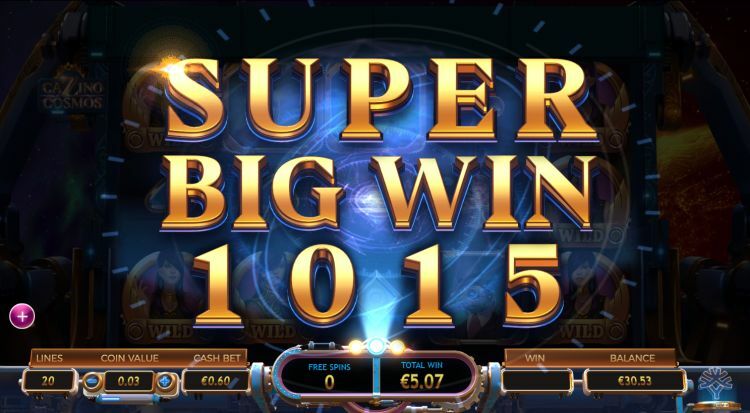 You can also gain incredibly high winnings on this slot, which can amount to almost 12,000 x the total bet. How does the Cazino Cosmos slot work? This slot has 20 fixed paylines, which are divided over 5 reels with 3 rows of symbols. The minimum bet for this slot is $€ 0.10 per spin. Of course, you can also bet more: the maximum bet is $€ 20 per spin. Cazino Cosmos is a high variance slot: so be careful with your bets. As a rule, the course of the game shows a lot of erratic behaviour. The theoretical payout rate is 96%. This is a fine percentage, although it is a percentage based on long term calculations. In the short term, the high variance of this slot will also show large, rollercoaster-like variance in the results. The high paying symbols look stunning and consist of several remarkable characters. The beautiful lady is the wild symbol. She awards you a price of 2,000 coins for a 5-of-a-kind. Also, the big boss (the red “Big Boss”) yields this amount for a 5-of-a-kind. The metal crow, a robot with the top hat and the “evil” cat, pay between 500 and 1,000 coins for a 5-of-a-kind on an active payline. Finally, we arrive at the low paying symbols: the card symbols. Do you spin a 5-of-a-kind of hearts, diamonds, spades or clubs? Then you win between 100 and 170 coins. 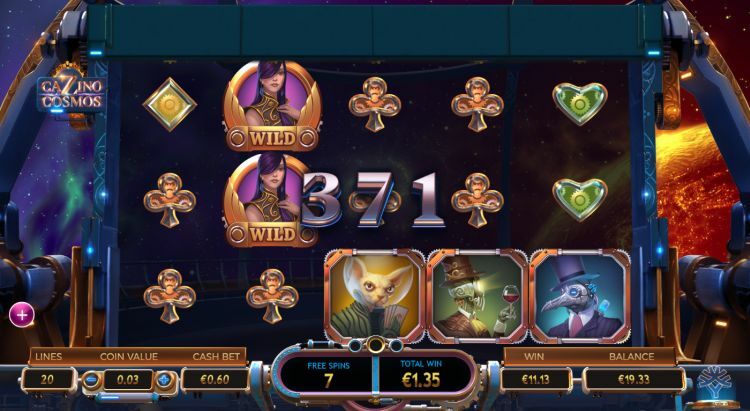 All the wilds that were on the reels when the bonus was activated, you keep and move along to the free spins bonus. This is important since all wild symbols become sticky during the free spins bonus. With a little luck, you can start the bonus round with a few extra wilds. 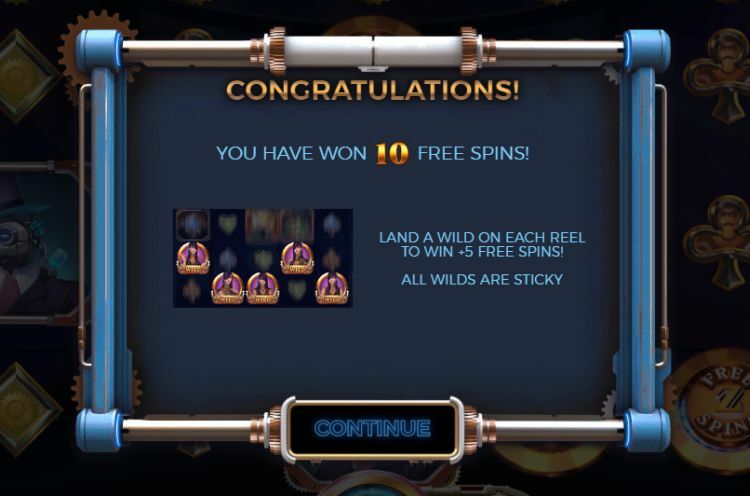 Are you able to spin at least 1 wild on each reel during the free spins? Then you get 5 extra free spins. The ultimate goal of this bonus feature is to build 1 or even more so-called Wild Lines, a payline with wild symbols. Because you keep the wilds, you are guaranteed to get a massive payout of at least 2,000 coins every spin. New to this slot is that you can save bonuses for extra special free spins, through the Wild Collection. At the top of the reels you see 5 meters, these have to be filled with special wild symbols. That’s not very easy, but luckily you get some free wilds the first time you start the game. Also, all personal history is saved by Cazino Cosmos, so you don’t have to start saving over and over again. Reel 1: Card Shot Free Spins. You are awarded free spins with 2 extra wilds. Understandably this kind of extra wild boosters can help you enormously on your way to build those Wild Lines and oh so desirable retrigger. Our verdict on the Cazino Cosmos slot? Yggdrasil did it again: they just managed to improve on the already cool Cazino Zeppelin in a way that leaves us speechless! Graphically the game is a beauty; you can win massive amounts of money and thanks to the sticky wilds every free spins bonus is a surprise. Where can you find Cazino Cosmos? The Cazino Cosmos slot is found at all reliable Yggdrasil casinos. One of these Yggdrasil casinos is Casumo, which is one of our favourite online casinos. You can play the Cazino Cosmos slot at Casumo with a 200% bonus up to $€50 plus 200 free spins.